IMAGE: The Kudankulam nuclear power plant in Tamil Nadu. 'This argument is false, because we are dealing with the 'civilian' nuclear power sector, which is open even to the IAEA,' says Dr A Gopalakrishnan, former chairman of the Atomic Energy Regulatory Board. Ever since the Fukushima nuclear meltdown in Japan in March 2011, dramatic course corrections have been initiated in various countries having nuclear power plants. India has merely carried out a cursory walk through inspection of its plants and projects under construction and is still continuing on with an accelerated programme to add on more large-scale nuclear units. This approach does not make any sense from the economic, safety, social and environmental impact point of view. Therefore, it is essential that these plans are halted immediately and seriously re-evaluated with the participation of a wider set of non-governmental experts. Immediately after Fukushima, eight of the 17 functioning nuclear plants in Germany were shut down, and in June 2011, that nation decided to establish a timeline for shutting down all its remaining plants by 2022. In 2010, Germany's electricity mix had 23 per cent nuclear and 17 per cent renewables; in 2014, it had been altered (external link) to 16 per cent nuclear and 28 per cent renewables. In May 2015, France's lower house of parliament approved a bill aiming to reduce France's dependency on nuclear power from the current 75 per cent to 50 per cent by 2025. The new bill (external link) also fixes the goal of increasing the proportion of renewables in French electricity production to 40 per cent by 2030. Till very recently, the Indian target for installed nuclear power was 63,000 megawatt by 2032, of which 40,000 MW was to be generated from imported foreign reactors. This figure was developed during the later stages of the India-United States nuclear deal to justify that, unless these reactors are imported through this deal and an indigenous fast breeder reactor programme is linked to it, India's electricity needs of 2050 and beyond cannot be met. But this conclusion was not reached on the basis of any studies on electricity needs. Rather, this convoluted argument was presented by the United Progressive Alliance government to justify the nuclear deal, in the course of which the government by then had already committed to the US, France and Russia, without informing Parliament, that India shall purchase at least 10,000 MW worth reactors from each of them as a quid pro quo for their support at the Nuclear Suppliers' Group in getting the India-specific concessions agreed to by them. Thus, today's National Democratic Alliance government can project an apparent claim that the path to a large growth rate in Indian nuclear power was handed down to them as a fait accompli by the UPA government through formalised agreements and understandings with foreign governments, and that the tenets of foreign policy dictate that the NDA government has no other option but to follow through in the UPA path. But, this argument is incorrect when one examines the details of this policy. I would hasten to add that the NDA government need not feign such helplessness and feel tied down by the UPA's hasty commitments of the past. The India-US deal was not based solely on an one-sided commitment to buy certain minimum number of costly reactors from the US, France, and Russia. Rather, through the Indo-US 123 Agreement, there is a return binding commitment from the US that, once the deal is cleared, the associated NSG clearance will enable India to access all nuclear technologies from developed countries on mutually agreeable commercial terms. This was promised by then prime minister Manmohan Singh, more than once, to Parliament. Since India is badly in need of technology and equipment imports for use in civilian nuclear enrichment and spent-fuel reprocessing for plutonium extraction (enrichment and reprocessing technologies), the UPA government might have considered that the entering into the nuclear deal can eventually be explained to Parliament and the people of India as a 'balanced' mutually beneficial set of commitments. But after the deal was signed and sealed, the Indian establishment which negotiated this deal was appalled to find the US government within the next two months itself actively ensuring through the NSG to modify their policy, so that thenceforth ENR transfers can be allowed only to countries who are members of the Nuclear Non-Proliferation Treaty and have accepted full-scope International Atomic Energy Agency safeguards. India is not and never intends to be a NPT member, and being a Nuclear Weapons State, can never come under IAEA full-scope safeguards as well. Thus, this was an intentional act in bad faith by the US. Though the UPA government made some feeble complaints about this to the US State Department, no redressal was forthcoming. Therefore, in my view, there is a strong case to renege our commitments to purchase imported reactors and compel the NSG and the developed countries to reverse the present ban on ENR technology sales to India. An excellent article (external link) on this entire ENR denial by Siddharth Varadarajan, which will give more insight into the matter. I urge the government to take up the issue with the US government and initiate a correction of the wrong done to India. This is quite a laudable policy, if it can also be seen to be implemented uniformly and is not merely put up in the PMO Web site for its rhetoric value. Sadly, the promised transparency is not visible in the case of the Kudankulam reactor (Unit-1), which is a civilian reactor under IAEA safeguards. A large amount of public funds have been spent on this reactor, with very little benefit accrued to the people in return. The reactor is known to have suffered continuous and unprecedented problems during the construction, erection and commissioning phases as well as during the present initial operation period till date. Instead of being callous and aloof, the least one expects from public institutions like the Nuclear Power Corporation of India and the Atomic Energy Regulatory Board is an honest explanation of the obviously serious problems and their origin. Through various open articles, I myself had brought out the shortcomings in material procurement for Kudankulam (external link) units and the associated suspicion of corruption, the Supreme Court Directives (external link) on ensuring safety in the Kudankulam plant, on mistakes made by Indian contractors in electrical & communication cable selection and their routing, etc (external link). There had been no reactions to my specific criticism of the plant activities from the NPCIL or the AERB. It has been a regular practice of both the UPA and NDA governments to term all persons who criticise NPCIL or AERB as anti-nationals or foreign agents without any proof. 'It looks to us as a very well-designed agenda for them, whoever is funding them, to stall or delay the development of our country' is what the new chairman of the Atomic Energy Commission seems to have recently said (external link). 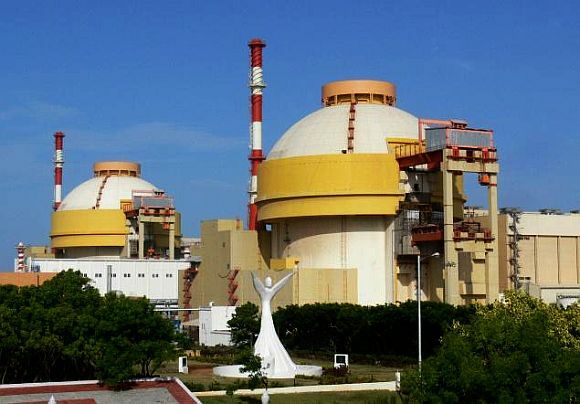 In Kudankulam, doubts still persist about serious deficiencies and corruption during the procurement phase, use of Indian subcontractors and corporates inexperienced in Water-Water Energetic Reactor (VVER) erection and commissioning because of their long-term close association and dealings with the NPCIL, the Department of Atomic Energy, and the AERB and the simultaneous under-utilisation of Russian consultants to save on costs, absence or shortcomings in independent third-party quality assurance of critical equipment and components etc. Though such transparency which the PM desires is generally absent in nuclear issues, in the Kudankulam case, where strong indications are that there are serious flaws of one kind or other, it certainly raises the doubt that the NPCIL and the AERB together may be hiding some serious deficiencies from the public. This impression needs to be removed by the AERB and NPCIL through honestly answering the doubts and questions raised by the public regarding this plant. The AERB as an 'independent' safety regulator is more of a myth than reality. In 1999, I was the first person to openly bring out the total lack of independence (external link) of the AERB from its masters in the DAE. Ever since I left as chairman of the AERB in 1996, every new chairman the government has appointed had been a long-standing DAE or NPCIL ex-employee, whose loyalty was almost entirely to the DAE organisations than to the general public. Since then, very scathing criticism (external link) about the lack of independence of the AERB has come formally from the IAEA, the Controller and Auditor General of India (external link), the JSCOT Committee of the Australian Parliament (external link) etc. In recent years, there was an inadequate bill presented before the parliamentary committee for creating an 'improved' nuclear safety regulator. But I understand, because of inaction of the government, that bill has lapsed and a fresh bill has to be re-introduced in Parliament. It is high time that the government considers doing this, after due consultation with experts in this field. Until then, the AERB is only seen as subservient to the government, and their opinions will not carry the weight of credibility or conviction anywhere in the world. In summary, there are several valid reasons why the nation should not plunge into a rapid expansion of the nuclear power sector without further serious introspection. Firstly, the per MW capital cost of even the cheapest nuclear plant is about 5 to 8 times the cost of coal power plants or hydro power stations. In a capital-scarce economy like ours, is it not madness to waste money like this, when tens of high priority social needs of the poor are not addressed because of shortage of funds? We need to re-examine our minimum electricity needs and cater to it through minimum-cost, reliable and environmentally acceptable generation technologies. Simultaneously, one needs to emphasise conservation of power and improvements in energy efficiency. Solar and wind energy must be tapped to the maximum extent, but we must not have the romantic notion that renewables alone will mostly meet our electricity needs. We need to limit and tailor our lifestyles, as a caring society, to make the least demand on electricity as a source of power. At the same time, under the guise of a 'Make in India' approach, for the imported nuclear reactors, equipment and subsystems are going to be made partly in Indian corporate manufacturing industries, with the sole intent of reducing the project cost from the very first such reactor. But attempts to cost minimise exactly in a similar manner at the Russian reactors in Kudankulam, from the very first unit of this kind, has resulted in very visible problems and serious concerns for the safety of the plant and safety of the inhabitants in the vicinity. We need to keep in view that we have now a situation in India where corruption and collusion among some of the administrators, politicians, industrialists and scientists and technologists in decision-making positions may be increasingly influencing high-cost purchases without any independent oversight. This approach could easily result in disastrous consequences in the case of hazardous technologies like nuclear power installations, especially in a nation like ours where nuclear regulatory capture is already a reality and no independent safety regulatory oversight is possible . It is hard to believe that all those who are pushing hard to accelerate the Indian nuclear power programme are doing so in the national interest. Ample amount of personal profit motive is also certainly driving them. Decisions on nuclear power have so far been taken by a small select group, primarily interested in profiteering from their actions, stating 'secrecy' as necessary from the national security point. This argument is false, because we are dealing with the ‘civilian’ nuclear power sector, which is open even to the IAEA. Therefore, a wider consultation with experts outside the government, eminent economists, environmentalists, sociologists etc is the imperative of the day. A pause and reconsideration of the nuclear power plans will allow just that. Who is killing India's nuclear scientists?